The thorn bug is an occasional pest of ornamentals and fruit trees in southern Florida. During heavy infestations, nymphs and adults form dense clusters around the twigs, branches and even small tree trunks. Some hosts that have been severely damaged include Hibiscus sp., powder-puff (Calliandra spp. ), woman's tongue tree (Albizzia lebbek), and Acacia spp. Young trees of jacaranda (Jacaranda acutifolia) and royal poinciana (Delonix regia) with a diameter of 1.5 to 2 inches have been killed by thorn bugs in the Tampa area. The trunks were so heavily infested that is was difficult to place a finger anywhere on the trunk without touching a specimen. The thorn bug causes damage by piercing the plant tissue and sucking the sap and by making cuts in the plant for oviposition. Butcher (1953) reported that certain trees, especially some cassias, suffered considerable loss of foliage, and that pithecellobiums (Pithecellobium spp.) suffered general and extensive terminal twig death. He also mentioned that thorn bug honeydew secretions and accompanying sooty mold development caused a nuisance to home owners. Kuitert (1958) noted that heavy accumulations of honeydew sometimes occurred on parked automobiles. Figure 1. Adult female thorn bug, Umbonia crassicornis (Amyot and Serville). Photograph by Lyle J.Buss, University of Florida. This thorn bug has been found throughout South and Central America, Mexico, and southern Florida. The Van Duzee (1917) records of Umbonia crassicornis in Ohio and South Carolina are puzzling. At best, these would seem to be accidental introductions in which no natural populations were maintained. In Florida, as of 1962, no thorn bugs were collected north of Winter Haven or south of Florida City according to Division of Plant Industry and University of Florida Agricultural Experiment Station records. However, the range of some of the hosts exceeds the range of the thorn bug. The original description in 1843 suggested that Umbonia crassicornis was present in Florida at that time, but this species apparently did not become abundant until the last 15 years. Butcher wrote that his first specimens were obtained in April 1951. In a personal letter, Nov. 7, 1962, Dr. E.G. Kelsheimer said, "Our first experience with the thorn bug was in 1948 at Delray Beach where it was thriving on Pithecellobium sp. At that time it was unknown on the west coast, but the next time it was reported to us from Fort Myers where it apparently came in on nursery stock. From Fort Myers it gradually worked its way up to Bradenton." Four species of Umbonia are present in the U.S., but they are only found in the subtropical regions (Arnett 2000). The most common is Umbonia crassicornis. The thorn bug is a variable species as to size, color and structure, particularly the pronotal horn of males. Typically, the adult is about 0.5 inch in length and is green or yellow with reddish lines and brownish markings. 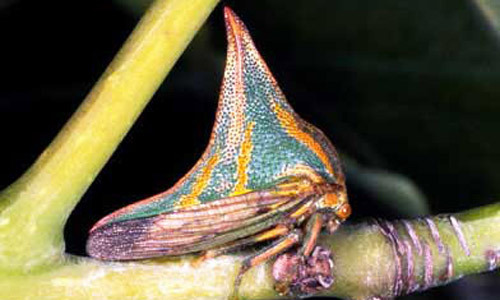 Other treehoppers sometimes mistaken for the thorn bug in Florida are the varieties Quadrivittata (Say) and Sagittata (Germar) of Platycotis vittata (Fabricius). These varieties have the pronotal horn, but other varieties of Platycotis vittata do not (Cook 1955). Figure 2. Adults of the thorn bug, Umbonia crassicornis (Amyot and Serville), showing variation in the species. Females are above, males are below. Photograph by Lyle J.Buss, University of Florida. 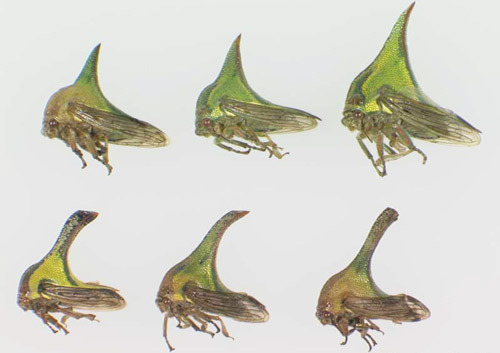 The horned specimens exhibit a low, forward-projecting anterior pronotal process as opposed to either the tall, essentially perpendicular horn of the female thorn bug or the high receiving horn of the male. The humeral processes of the thorn bug are larger than those of Platycotis vittata. Platycotis vittata lives primarily on oak (Quercus spp.) in Florida, whereas DPI has no reports of the thorn bug on oak. Figure 3. Adults and nymph of the thorn bug, Umbonia crassicornis (Amyot and Serville). Males, A-C; Female - D; Nymph - E. Photograph by Division of Plant Industry. Females lay their eggs in the tender bark of twigs and the eggs hatch about 20 days later. The female actively tends her brood or colony, which can number from 15 to 50 individuals. Young nymphs have three horns instead of the one seen on the adults. While four generations occur per year, females lay only a single clutch of eggs. (Johnson and Lyon 1994). The species has a chemical communication that aids in the defense of the young. This chemical passes between the parent and nymphs, making them distasteful to potential predators (Johnson and Lyon 1994). In addition to the above species, immatures and adults have been found on wild tamarind (Lysiloma bahamensis), tamarind (Tamarindus indica), Casuarina sp., Crotalaria sp., rayado bundleflower (Desmanthus virgatus), bottle brush (Callistemon sp. ), Jerusalem thorn (Parkinsonia aculeata), dwarf date palm (Phoenix roebeleni), and from Steiner traps placed in a variety of trees. Adults have been reported on Citrus spp., Bidens pilosa, bagpod (Sesbania vesicaria) or (Glottidium vesicarium), avocado fruit (Persea americana), holly (Ilex sp. ), lychee (Litchi chinensis), Caesalpinia sp., and Mimosa sp. Adults and nymphs can be found all year. Reports of heavy infestations have been received in all seasons, but probably more have come in during the cooler months. Cyclic phenomena also may play a part. Due perhaps to the sporadic nature of the thorn bug, experimental work on the control of this pest is very limited. Butcher FG. 1953. Unusual abundance of the tree-hopper Umbonia crassicornis A. & S. Florida Entomologist 36: 57-59. Cook Jr PP. 1955. Notes on nomenclature and variation in Platycotis. Pan-Pacific Entomologist 31: 151-154. Goding FW. 1929. The membracidae of South America and the Antilles. IV. Sub-families Hoplophorioninae, Darninae, Smiliinae, Tragopinae (Homoptera). Transactions of the American Entomological Society 55: 202-205. Goding FW. 1930. An injurious membracid. Journal of the New York Entomological Society 38: 47. Johnson WT, Lyon HH. 1994. Insects that feed on trees and shrubs. Cornell University Press. pp. 1-560. Kuitert LC. 1958. Insect pests of ornamental plants. University of Florida Agricultural Experiment Station Gainesville Bulletin 595: 14-15. Maxwell LS. 1959. Handbook of Florida insects and their control. Great Outdoors Publishing Co., St. Petersburg, Florida. p. 33. Van Duzee EP. 1917. Catalogue of the Hemiptera of America north of Mexico, excepting the Aphididae, Coccidae and Aleurodidae. University of California Agricultural Experiment Station Technical Bulletin, Entomology 2: 557-558. Authors: F.W. Mead (retired), Florida Department of Agriculture and Consumer Services, Division of Plant Industry; and Thomas R. Fasulo, University of Florida. Originally published as DPI Entomology Circular 8. Updated for this publication. Publication Date: November 2000. Latest revision: August 2014. Reviewed: December 2017.